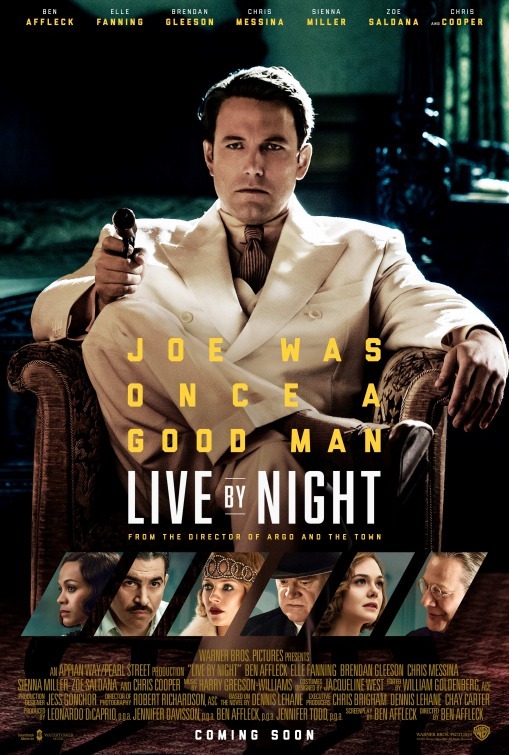 An up and coming Gangster tries to establish himself as being a credible player among his contemporaries in the cut throat prohibition era in Ben Affleck’s Live by Night. Ben Affleck has never really impressed me as an actor -other than playing Batman or in The Accountant– so I find his directorial efforts to be something of a double edged sword. I think he does great work as a director but I don’t understand why he continues to play the lead role in his own films. He’s not a terrible actor but I find him really bland pretty much all the time which means that his performances can only really be so engaging to me. This is a problem in this film. Joe Coughlin (Ben Affleck) is a really compelling character on paper. He’s smart, sophisticated, good looking, personable and able to handle himself in really sticky situations. Everything we learn about him over the course of the film tells us that this is a man who will carry a film effortlessly yet he doesn’t. Most of those traits are told to us more than we see them which makes it difficult to invest in what he says and the relationships he forges and Affleck doesn’t quite manage to sell this. A more capable actor might have been able to salvage this but Affleck isn’t really up to the task. In fairness he doesn’t give himself an awful lot to work which which is bizarre given that he is the director. The early part of the film is the most interesting as it quickly depicts the rise of Coughlin through the ranks before he is sent to Tampa where he essentially has to start all over again. It’s quite a jarring shift since the Boston setting seemed to be pretty well established before that point. I get that it’s supposed to convey how fickle and changeable the life of a Gangster is but the change feels somewhat unnecessary considering the strong material up to that point. Once the film shifts locations to Tampa the pacing grinds to a halt and never quite recovers. Another way to do it would be to spend a fair bit of time showing how Tampa works differently to Boston when it comes to the criminal element. This does happen but it is over with too quickly so never really feels substantial. There were good things in there but not enough to keep things interesting. The other characters are as problematic as Coughlin as they have so little to do. Zoe Saldana is wasted as a forgettable love interest who comes and goes without really adding anything. There is a fairly compelling subplot involving Chris Cooper’s Chief Figgis and his daughter Loretta (Elle Fanning) who becomes a devout Christian after going completely off the rails trying to make it in Hollywood. Any scene featuring either of them is good value and I would have liked to see more of it. Sienna Miller does some really good work as an early love interest who seems to be able to match wits with Coughlin and clearly has a strong bond with him. This was definitely the most interesting and memorable relationship in the film even though it ends fairly quickly and doesn’t have an ending that is satisfying. One thing this film does excel in is the production design. The time period is faithfully recreated and there’s a general retro feel about the way Affleck directs this. If the content had been stronger then the vibrant time period would really have had an opportunity to be shown off but everything was impressive to look at despite that. Another strong aspect was the action sequences. They were well shot, easy to follow and really visceral. Affleck manages to create some real tension as people are killed in brutal and chaotic take downs and injects a lot of energy into the car chases. It’s amazing how much of a difference minimising the cuts during action makes. A disappointing effort that fails to recover once the pace of the film grinds to a halt. The early scenes set in Boston are impressive but the whole film goes downhill once the story moves to Tampa. Excellent production design and well put together action sequences aren’t enough to save this from becoming dull and Ben Affleck isn’t very well suited to playing the main character. The supporting cast are underused but there are some interesting characters that work well when they appear. There was a better film in here somewhere but it probably counts as Affleck’s weakest outing as a director.